From steep rugged cliffs and rocky coasts to vast green countryside and mist-enshrouded landscapes, Ireland is hauntingly majestic and beautiful. In addition to breathtaking scenery, Ireland has no lack of pubs and plenty of music and beer festivals where you can enjoy a pint of Guinness while listening to fiddle players and jazz musicians. The center of Ireland is located at 53.41 degrees North (latitude) and 8.24 degrees West (longitude). County Wicklow, known as the "Garden of Ireland", is home to Powerscourt, 45 acres of what is arguably the world's greatest garden. Stroll among stunning terraces, ornamental lakes, and flower beds, as well as a dolphin pond and Japanese garden. 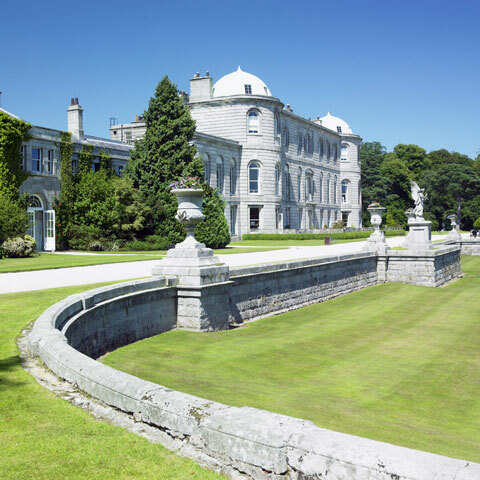 Visit the Powerscourt manor, designed to resemble a 13th century castle, and enjoy a round of golf at the 36-hole Powerscourt golf resort, one of Ireland's finest. Powerscourt is located near Enniskerry, 12 miles south of Dublin. If you are looking for a cozy inn built into the ruins of a medieval castle, look no further than the Ballymaloe House, located in Shangarry. The owner, Myrtle Allen, has resided here since 1947 and raised her six children here before becoming an internationally known cookbook author and hostess. Most of the ingredients served at Ballymaloe come from the its orchards, gardens, and 400 acre working farm. Myrtle's daughter-in-law, Darina Allen, runs Ireland's first cooking school from a converted apple barn nearby. Over 30 different cooking courses are available, taking anywhere form one day to several weeks. Shangarry is 20 miles east of Cork, and 150 miles west of Dublin. Rugged beauty can be found in the county of Donegal's mostly uninhabited coastline. The tallest sea cliffs in Europe, known as Slieve League, reside here, as do Ireland's steepest mountains. Be sure to visit the spectacular Glenveagh National Park, which contains Glenveagh Castle and its exotic gardens. Ireland's native language, Gaelic, is proudly spoken in Donegal. Donegal Town is 138 miles northwest of Dublin, and Glenveagh National Park is a 45 minute drive northeast of Donegal Town. The best time to visit the park is mid-May. Ireland abounds with wild, natural splendor, making it easy to see the attraction it holds for artists and poets alike. Whether you are visiting for the culture of music and a good beer or are looking to discover the untamed countryside, Ireland will not disappoint.